Apple's iOS 7.1, which was released on Monday, hit a 5.9 percent adoption rate in just the first 24 hours, according to Chitika. The marketing research company released a report on Tuesday based on the operating systems reported in their app metrics platform. Generally speaking, Apple's iOS has always enjoyed fast adoption rates, something that is important to developers as it allows them to better focus their resources. Chitika noted that iOS 7.0.6 enjoyed a similar fast tract during its first 24 hours, at 6 percent. 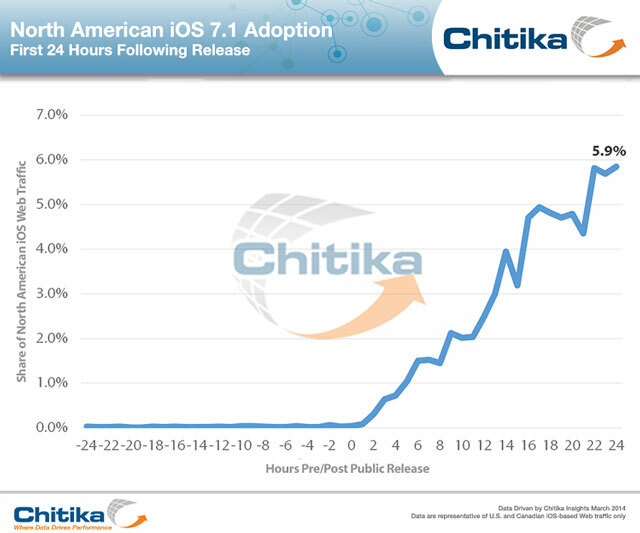 All told, iOS 7.x claimed 80 percent of iOS traffic in Chitika's most recent three day study. To put this adoption rate in perspective, let's visit our friends in the Android ecosystem. According to Google's Android Developer Dashboard, the most recent version of Android—KitKat, or Android Android 4.4—is on...let's see. 2.5 percent of devices checking into Google Play. When was KitKat released? Novemberish of 2013, roughly four months ago. All three releases of Jelly Bean, the previous version of Android, have a combined total of 62 percent penetration. It was first released in Julyish of 2012.